Still struggling in the postrecession, local flower shops aren't just competing with supermarkets, discounters, and do-it-yourselfers. They're fighting to survive as a growing number of online middlemen known as "order-gatherers" sweep into the marketplace and take orders local florists used to receive. "It's like a tsunami that can't be stopped," says Rick Pannepacker, owner of Penny's Flowers in Glenside, a family business since 1937. Google flowers and Glenside, and Penny's pops up. So do fromyouflowers.com, flowerdeliveryexpress.com, and other websites that display no local address or phone number, but do include phrases like Glenside Flowers and Best Glenside, PA Same Day Flower Delivery, which local florists complain give the impression that they're real shops located right around the corner. They aren't shops. They take orders online and from toll-free numbers, add the standard 20 percent commission and other fees (that florists claim are too high), and then relay the order to a florist in the recipient's hometown - Penny's, say - to be filled and delivered. By the time Penny's gets it, the commission and fees have been deducted from the $80 order, which is now worth $50. After Pannepacker deducts his $10 delivery fee, he's left with $40 - half the original order - to make the beautiful flower arrangement the customer chose from the order-gatherer's website. It's a no-win situation: Pannepacker can either fill the full order and lose money, or substitute a cheaper arrangement and risk consumer outrage. "What can you do? We're all kind of stuck," he says. Here's what florists are doing: They have organized the nonprofit Florists for Change and set up a website (www.RealLocalFlorists.com) to help consumers find them directly. They're raising their online profile, urging customers to add flowers to their "buy-local" list, and trying to promote the things they can do that order-gatherers can't, such as creating custom orders and focusing on special occasions and niche markets. Many florists also are refusing to work with the middlemen, sometimes derided as "DOGs," for "deceptive order-gatherers." "These companies continue to proliferate because it's easy money . . . and we're losing our shirts," says Bonnie Bank, controller at Superior Florist in New York City and a board member at Florists for Change, which was founded in 2011 and has about 225 members nationally. The ranks of U.S. florists have dwindled from 27,341 in 1992 to 15,307 in 2011, the latest figures available, according to the Society of American Florists, whose 15,000 members represent all sectors of the flower industry, including order-gatherers. John Zhang, marketing professor at the University of Pennsylvania's Wharton School, likens the plight of florists to the airline ticket, hotel reservation, and travel industries, which all have been transformed by third-party websites. "Technology inevitably will change their industry, and florists need to understand what ways their business will change so they can adapt," Zhang says, citing travel agents who survived by offering highly individualized tours. Shirley Lyons, longtime florist in Eugene, Ore., and president of the Society of American Florists, says most of the order-gatherers are telemarketers, but some are "local florists who decided to become, in this new technology, more aggressive in capturing orders by reaching out around the country." And while other florists may not like it, the order-gatherer business model is not illegal per se, Lyons says: "Many consumers know [that] when there's a toll-free number, probably this is not their local florist." Her group's main concern, Lyons says, is "the deceptive phone listings where companies present themselves under a variety of fictitious names with perhaps a local telephone number . . . misrepresenting their geographic location by saying they're from Eugene, Ore., for example, when they're not." Laws in 29 states, including Pennsylvania and New Jersey, make it illegal for flower shops or businesses generally to represent themselves this way. But many of the laws were prompted by deceptive Yellow Pages listings, and don't translate well to the Internet. "It's kind of a Wild West," Lyons says. Online complaints are common, however, and the Better Business Bureau has received thousands, including 681 over the last three years against the Connecticut-based From You Flowers L.L.C. Efforts last week to reach principals of From You Flowers L.L.C., its listings (fromyouflowers.com, sendflowers.com, usaflorist.com, and florist-express.com), and several other online retailers were unsuccessful. 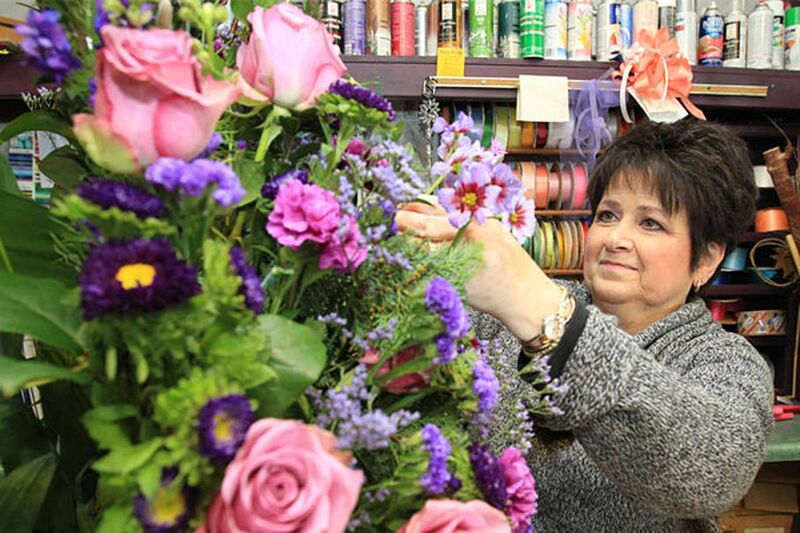 One local florist who has jumped into the national online marketplace is Kremp Florist in Willow Grove, a three-generation family business that displays its local address, phone number, and story under the "About Us" tab on its website. Scott Kremp, company president, argues that local florists historically used wire services such as FTD and Teleflora to arrange for flower deliveries all over the country. "Now, you call us to send something to California, and we call an affiliate in California directly to get it for you," he says. "It's the same exact thing." Like a growing number of his peers, Kremp has stopped working with certain order-gatherers because of the high fees and habit of sending orders for grand arrangements that cannot be filled for the advertised price. "We treat you the same whether you're calling from Idaho or Abington," says Kremp, who charges a flat relay/delivery charge and decries the business practices of the order-gatherers that florists are complaining about. "They make us look bad," he says. So Flowers by David is dealing solely with other florists, an arrangement that offers a more equitable division of fees, and marketing its artistic arrangements, personal service, and community roots. "I may not be the largest and the busiest florist in the world," Robin Heller says, "but I'm going to be a profitable florist and make enough to stay in business."